We are the Voice. : Think. Eat. Save. We can do a lot more than we think we are "Incapable" of. RISE UP. World Environment Day (5th June) is not just today- it's everyday! Think of this- When you are munching that KFC Chicken Shotz , or adding extra sauce or cheese on McD Burgers, there are more than 20,000 children under the age of 5 dying daily from hunger. We carelessly tend to over-order and waste food (and of-course, the Money) while throughout the world 1 in every 7 people go to bed hungry. Though "it's not my problem" if they are hungry or "it's my money and I will use or waste it my way", it comes down to the fact that your small effort could help millions to eat something (which is better than nothing) and make them live a little longer and maybe see Apple i7 or experience the feel of wearing a Google Glass or just as simple things like going to bed with half-filled stomach (atleast it'll make them see the next day sunlight). "While I have two hands, I'll use one to feed myself, and the other? Maybe, I'll see if I can feed someone to make them live!" If we are 7 Billion people in this world and 1 Billion are hungry, think of what difference could it make when 6 Billion could save a Dollar, Rupee, Euro, Dinar, etc. in making wise decisons while buying food, or contributing the same to feed a hungry person on the next street or a place you visit. Remember, we have this life and we'll live it once, make a difference in this life, and you'll see reincarnation is in fact possible- atleast for You, for your Kindness, for helping a Life! So, next time you and your friends sit for a party- order less or just enough not to be wasted, save some money from it, visit a Shelter-home or a slum and feed a few people. You'll raise a glass for your goodness in the next party! 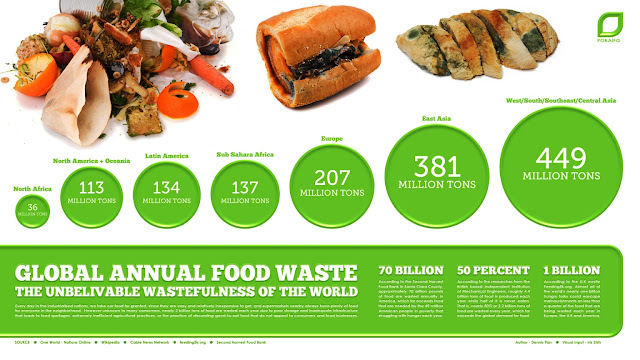 Here's an infographic about the amount of Food Wasted globally, every year. Can we do something to reduce it? As UNEP (United Nations Environment Programme) puts, "THINK before you EAT and help SAVE our environment!"